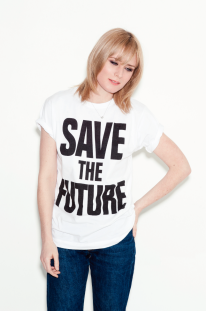 The Stylist Den: H&M Conscious T-Shirt and Climate Week - Would you wear it? H&M Conscious T-Shirt and Climate Week - Would you wear it? 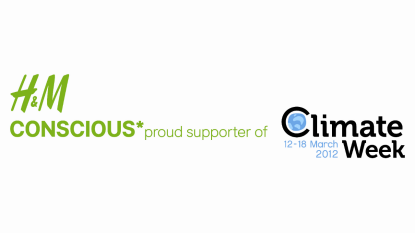 12 -18 of March it's Climate Week, a British climate change campaign backed by Sienna Miller, Lily Cole and the prime Minister. H&M is part of it with two main campaings - Recycle your clothes and a T-Shirt. 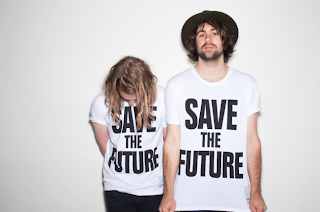 The second campign it's the Katharine Hamnett 'Save the Future' T-Shirt at £9.99, 100% organic cotton and 25% of the sale rice will go to the Environmental Justice Foundation to help climate change refugee. The trouble here it's the product though, or maybe it's me. As much as I'm willing to help this organisation and the climate change issue as a whole, I don't think that I like the T-Shirt enough to buy and wear it. I don't find anything special about the design of it that would get me to go to H&M and get a T-Shirt with a huge slogan on it. 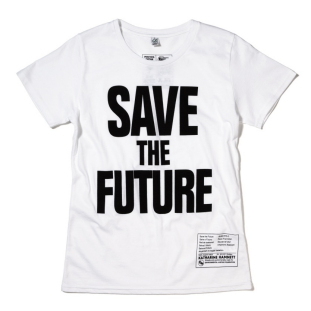 La seconda iniziativa e' la maglietta 'Save the Future' disegnata da Katharine Hamnett a £9.99, di cotone biologico, di cui il 25% del prezzo va alla Environmental Justice Foundation in aiuto dei rifugiati a causa dei disastri naturali. Il problema qui pero' e' il prodotto, o forse sono io. Per quanto io possa essere propenso ad aiutare questa organizzazione ed il problema del cambiamento climatico in generale, non penso che questa maglietta mi piaccia abbastanza da comprarla ed indossarla. Non trovo nulla di particolare nel design che mi psinge ad andare da H&M e acquistare una maglietta con uno slogan gigantesco. Maybe I'm not who they are targeting as their PR pics show young, up and coming singers wearing the T-Shirt -Sunday Girl and the Vaccines - and the well known Roisin Murphy, but here's the usual problem with most of the eco-friendly fashion garments. They are simply not really appealing or trendy. I'm not an expert on the subject matter but a did just abit of reaserch lately for a eco-friendly shoot I may style and it is really hard, particularly to a mid/low price points to find decent stuff. So here the question: 'For the sake of climate change would you wear that T-Shirt?'. Forse non faccio parte del target di riferimento visto che le foto della campagna mostrano cantanti e musicisti emergenti - Sunday Girl e i Vaccines - o la piu' conosciuta Roisin Murphy, ma qui c'e' il solito problema con la maggior parte dei capi eco-friendly. Semplicemente non sono 'belli' o trendy. Non sono un esperto in materia ma facendo un po' di ricerca per uno shooting eco-friendly su cui forse lavorero', ho troavato veramente difficile, sopratutto a prezzi medi e bassi, trovare delle cose decenti. Ecco quindi la domanda: ' Per interesse verso il cambiamento climato indossereste quella maglietta? '.